What if you could reverse time? The TimeMachine debugging suite offers a range of innovative trace analysis tools that let you debug both forward and backward in time, making it easier to solve the hardest bugs. With TimeMachine, embedded developers can find and fix bugs faster, optimize with ease, and test with confidence. The TimeMachine debugging suite extends the range of Green Hills Software’s popular MULTI integrated development environment (IDE) by providing a window into the complex interactions in software that can result in bugs, performance problems, and testing nightmares. By presenting this information in easy-to-understand displays, TimeMachine enables developers to quickly navigate through trace data and produce better code in less time. EventAnalyzer: The TimeMachine suite is integrated with the MULTI EventAnalyzer, which displays a view of operating system events over time. This display helps track down bad interactions such as deadlocks between various tasks that cause undesirable behavior in your system. 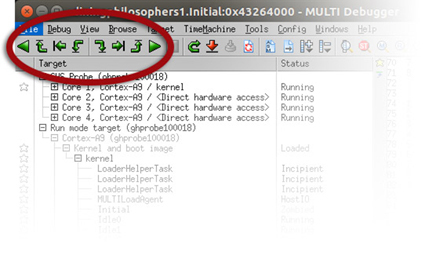 TimeMachine supports both Green Hills Software operating systems: the INTEGRITY RTOS and the µ-velOSity RTOS. By displaying the length and frequency of INTEGRITY RTOS events, the EventAnalyzer helps you tackle high-level performance problems. 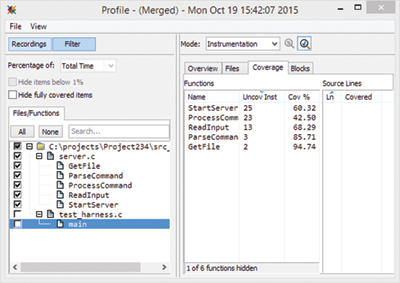 Profiler: The integration of the TimeMachine suite with the MULTI Profiler helps to quickly determine how much time an application spends in various places. The MULTI Profiler can create reports with valuable and revealing information about blocks, source lines, and functions to make it easier to find and fix performance problems. During testing, The TimeMachine suite’s powerful code coverage tools allow you to easily determine which particular instructions in the application were executed. This information makes it easy to analyze the quality of your test suite and identify segments of code that have not been thoroughly tested. 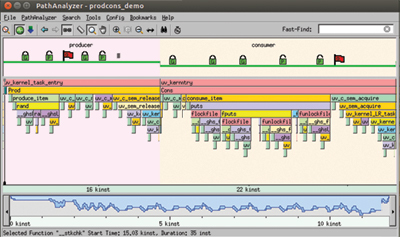 The MULTI Profiler provides code coverage reports that show which blocks and source lines have not been executed.